Helen Bingham from Keep Britain Tidy shares with us more about their work, what’s going on across the country and how BB Companies can get involved. What is Keep Britain Tidy about? Places blighted by litter or neglected make people feel unsafe and this has an economic impact – no one wants to visit or invest in an area where it looks like people don’t care. Keep Britain Tidy is one of the country’s leading environmental charities. It focuses on the environment on people’s doorstep, campaigning to reduce litter and waste and improve parks, beaches and waterways. If we don’t care for the environment on our doorstep, how can we expect to care for the global environment? Improving the quality of the places and spaces we share is at the heart of everything that Keep Britain Tidy does. 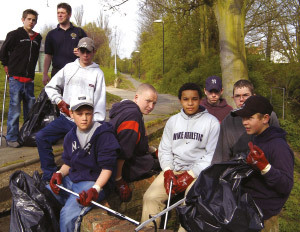 Whether it is supporting communities with clean-ups, helping local authorities change the behaviour of the minority of people who drop litter or don’t pick up after their dog or delivering campaigns that encourage mass participation in positive activities, Keep Britain Tidy is committed to driving forward the changes that everyone wants to see – a cleaner, greener country. Litter picking is fun and you can make a real difference – a difference that you can see straight away. There is something very satisfying about arriving somewhere that looks littered and unloved and, with a little bit of effort, turning it into somewhere that looks like someone cares. It is also a great way of getting children and young people to understand the scale and the impact of litter on our environment and starting conversations about the amount of waste we produce, particularly things like plastic bottles and aluminium drinks cans. These things could and should be recycled but, once littered, they blight our environment and, ultimately, end up either polluting our rivers and oceans or being swept up and sent to landfill. Here at Keep Britain Tidy we support groups and individuals who litter pick 365 days a year through The Big Tidy Up but we are also holding the country’s biggest-ever mass participation clean-up next year with up to half a million volunteers taking part on the weekend of 3rd to 5th March 2017. Last year, 250,000 people took part in Clean for The Queen, collecting; this year we are hoping to double the number of participants. It’s easy to take part - you can simply register at greatbritishspringclean.co.uk and you can get all the help and resources you need to organise your own Great British Spring Clean or join with others to take part in a clean-up. Keep Britain Tidy supports thousands of volunteers around the country who are taking action to improve the environment on their doorstep. We run WaterCare projects in the Midlands, the North-West, East Anglia and the South-West that support communities. 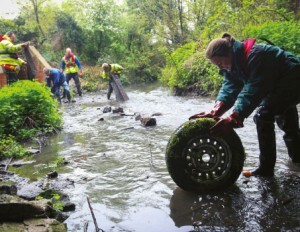 Whether it’s cleaning up a brook, doing water testing, getting rid of invasive species or creating new habitats, the WaterCare projects are making a huge difference to places. 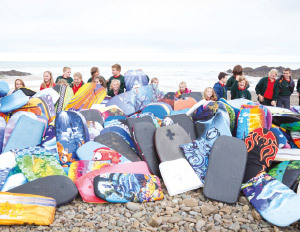 A recent campaign by our BeachCare project in Cornwall demonstrated the impact of the cheap body boards that form a part of many people’s holiday by the sea. The volunteers collected 600 broken boards that had been left by visitors over the summer and piled them all up to demonstrate the scale of the problem. We are consuming our planet’s resources at an ever-increasing rate and generating waste that is choking the planet. Waste Less, Live More is a campaign that aims to show us that wasting less doesn’t have to mean sacrifice – what’s good for the planet can also be good for us. In 2016, more than 40,000 people took the Waste less, Live more Challenge. The Challenge consisted of 101 different things that people could do that would cut their environmental impact at the same time as being fun. Suggestions included ‘Scoot to school’, ‘Row a boat’ and ‘Give a hen a home’. Our parks are a national treasure and are used by millions of people every year. In fact, more people use a park each year than voted at the last General Election. However, due to the cuts to local authority budgets, our parks are feeling the pinch. There are less resources and less people to keep the parks clean and safe and a recent Heritage Lottery Fund on the State of UK Parks warned they were at risk of decline. Anyone who remembers the 1970s and 80s knows that our parks have come a long way since then and, if we want them to stay that way, we all have a role to play. Love Parks Week is a celebration of our fantastic parks and the thousands of Friends’ Groups that give their time to help them stay that way.